Draft: 9 ft. 4 in. 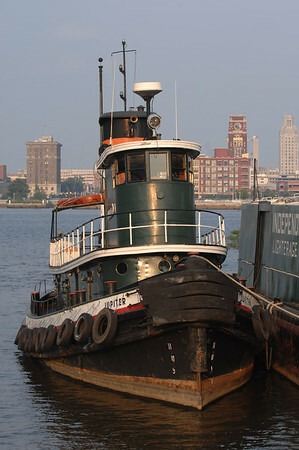 The tug Jupiter was built in the Philadelphia shipyard of Neafie and Levy in 1902. Built out of charcoal iron, she was made for the Standard Oil Company and christened Sacony #14. From 1902 to 1939, she was in service in New York, towing Standard Oil fuel ships and barges. In 1939, she was purchased by Independent Pier Company to work in Philadelphia. After World War II, she was converted from a steam tug to diesel, using the salvaged engine from a decommissioned Landing Ship Tank (LST). In 1999, the Jupiter was purchased by Penn's Landing and turned over to the care of the Philadelphia Ship Preservation Guild. Currently, she takes part in educational programs, festivals, and boat parades. Jupiter is also used as a functioning tug, moving the Ship Guild's other vessels. The operation and maintenance is performed by a volunteer group of active and retired tugboat professionals and enthusiasts.